Shown below is a silent movie of a few test jobs I created to see how well tool contact would be maintained during motion in A and B axis while the x,y,z are moved to keep the tool in the right position. This is the flow toolpath in Fusion360 in action. Non familiarity with these CAM paths makes for a learning curve which is interesting when paired with a custom made 5th that you are trying to debug at the same time. I haven't tested how well the setup works when cutting harder materials like alloy yet. 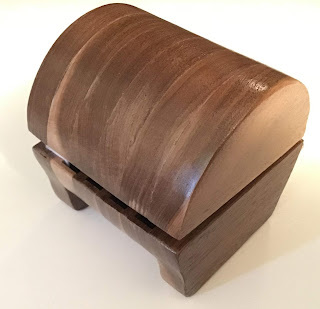 It is much quieter and forgiving to test cutting on timber and be reasonably sure about the toolpaths and that you are not going to accidentally crash to deep into the material after a 90 degree rotation. After a little bit of calibration and tinkering in the fusion360 cps output filter files the cnc is starting to take advantage of the new 5th axis. Below is a "Flow" multiaxis toolpath finishing a sphere with a flat endmill. There are still some issues that I have to address. It has been a surprisingly good experience so far. Starting out cutting 5 sides of a block and moving on to cutting the edges at an angle. This is the third test where I rough out the sphere using a 3d adaptive path and then use a flow multiaxis path to clean things up. Things look better in video and there is some of that to come. Close up filters attach to the end of a camera lens and allow you to take photos closer to the subject than you normally would have been able to do. This is very handy for electronics and other work as you can get clear images of circuit boards and other small detail. I recently got a collection of 3 such filters which didn't come with any sort of real holder, the container they shipped in was not really designed for longer term use. The above is the starting design for a filter holder cut in layers from walnut and stacked together to create the enclosure. The inside is shown below where the outer diameter can hold the 80mm black ring and the inner circles are 70mm and are there to keep the filters from touching each other. Close up filters can be quite fish eyed looking with a substantial curve to the lens on the filter, so a gap is needed to keep each filter away from the next one. 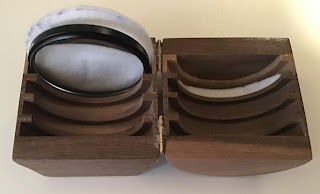 A little felt is used to cushion the filter from the walnut itself which adds roughly 1.5mm to the design so the felt layer all have space to live as well. The bottom has little feet which extend slightly beyond the tangent of the circle so they both make good contact with the ground and there is no rocking. Using two very cheap hinges works well in this design to try to minimize the sideways movement (slop) in the hinges themselves. A small leather strap will finish the enclosure off allowing it to be secured closed. It is wonderful to be able to turn something like this around. 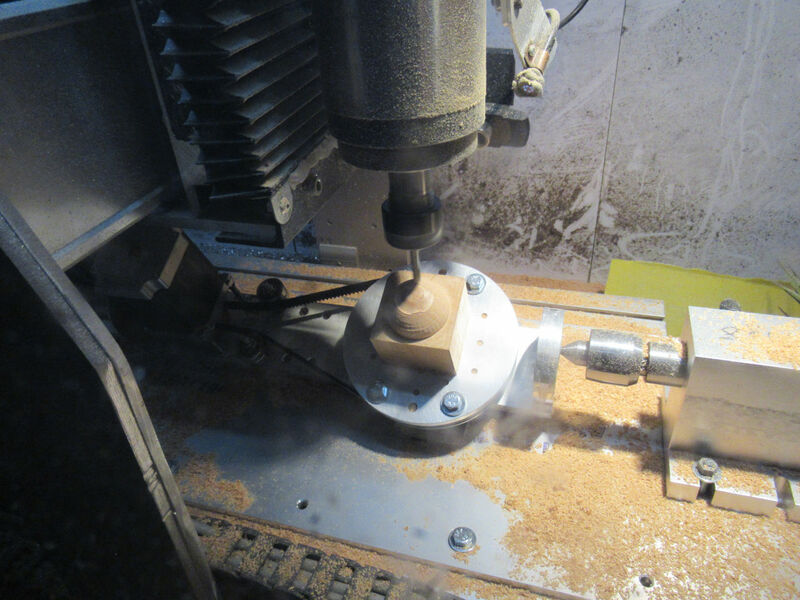 I can only imagine what the world looks like from the perspective of somebody who is used to machining with 5 axis CNC. The choice of replacing the small marble table entirely or trying to "work around" it with walnut. The lower walnut tabletop is about 44cm by 55cm and is just low enough to give easy access to slide laptop(s) under the main table top. The top floating shelf is wide enough to happily accommodate two ipad sized tablets. The top shelf and lower tabletop are attached to the backing by steel brackets which cut through to the back through four CNC created mortises. Cutting the mortises was interesting, I had to drop back to using a 1/2 inch cutting bit in order to service the 45mm depth of the timber. The back panel was held down with machining clamps but toggles would have done the trick, it was just what was on hand at the time. I cut the mortises through from the back using an upcut bit and the front turned out very clean without any blow out. You could probably cut yourself on the finish it was so clean. The upcut doesn't make a difference in this job but it is always good to plan and see the outcomes for the next time when the cut will be exposed. The fine grain of walnut is great to work with CNC, though most of my bits are upcut for metal work. 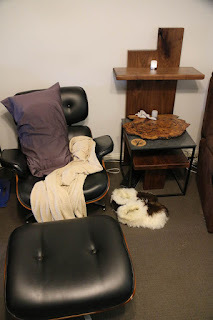 I will likely move on to adding a head rest to the eames chair next. But that is a story for another day. When you enter the 4th and 5th axis world for cnc things start getting interesting. I have started looking at how LinuxCNC works with a plan to use it as the primary gcode runner on a higher axis machine. Of the many options that LinuxCNC offers, I might start out using a parallel port and small breakout board to software signal some stepper controllers. These controllers have an enable, step, and direction pin and can be wired up in a few ways. This involves if the signal goes to the A+ pin or if you run high voltage to those A+ pins and run the signal to the A- pin. See for example about half way down this smoothieboard page. Anyway, back to the LinuxCNC topic. The main thing that controls how well you can control stepper motors over the parallel port is how accurately the LinuxCNC process can schedule itself. if there is a big delay or jitter between calls that are supposed to be at a fixed distance in time apart then the machine control will not be as you might like. The latency-test program can be used to see the jitter. The LinuxCNC images are based on Debian wheezy. This distribution includes a Linux kernel designed for supporting real time operation. There are a few real time Linux options floating around and the kernel on stretch (rt preempt) that is installed by installing linuxcnc-uspace is different to the one used by the wheezy image (RTAI). IIRC. For controlling the machine I put together a combination for around $200 including an Intel Pentium G4560 on a Asus H110M-C2 with 4gb of 2400Mhz RAM. This relies on having cases, psu, drives etc already. This has an Intel NIC and onboard prt header (no pci bracket). The CPU has 2 cores and can do two HT. Booting the current LinuxCNC iso image and running the latency-test gave about 3200 idle and 5100 under load. The two downsides are that the kernel was old enough that M.2 didn't work and the NIC was not detected. The latency-test came out at about 40,000 idle and up to 70,000 under load. Not quite what I had hoped for. Adding "isolcpus=2,3 idle=poll intel_idle.max_cstate=0 processor.max_cstate=0" to the kernel cmdline and using taskset -cp 2 $pid moved the numbers to 22,000 and 40,000 respectively. Better, but not what I had seen on the official recommended ISO bootup. To cut a long story short(er) doing a telinit 3 and going non graphical on the control machine and using ssh -Y to login and run the latency-test I was able to get down to 4000 under load. This is again by forcing the rtapi_app to use a reserved CPU core. Maybe using a different graphics card or some other graphics options would allow the latency to be lower on the display of the machine. But I'm fairly happy to run the GUI to display on the laptop to harvest the better latency numbers. It is handy to be able to get closer to the jitter numbers that are given when using the official ISO for LinuxCNC as it gives the feeling that I'm not loosing out on good machine control because I'm on stretch and a customized setup. Ironically, using the nice new hardware for the build actually made initial setup harder. Though I imagine that is a temporary situation. Hopefully those better jitter numbers can be had for real machining over the network too. A while back I ported most of the libferris suite over to using boost for smart pointers and for signals. The later was not such a problem but there were always some fringe cases to the former and this lead to a delay in releasing it because there were some known issues. I have moved that code into a branch locally and reverted back to using the Modern C++ Loki library for intrusive reference counting and sigc++. I imported my old test suite into the main libferris repo and will flesh that out over time. I might do a 2.0.0 or 1.9.9 release soonish so that the entire stack is out there. As this has the main memory management stuff that has been working fine for the last 10 years this shouldn't be more unstable than it was before. I was tempted to use travis ci for testing but will likely move to using a local vm. Virtualization has gotten much more convenient and I'm happy to setup a local test VM for this task which also breaks a dependency on companies which really doesn't need to be there. Yes, I will host releases and a copy of git in some place like github or gitlab or whatever to make that distribution more convenient. On the other hand, anyone could run the test suite which will be in the main libferris distro if they feel the desire. So after this next release I will slowly at leisure work to flesh out the testsuite and fix issues that I find by running it over time. This gives a much more incremental development which will hopefully be more friendly to the limited time patches that I throw at the project. One upside of being fully at the mercy of my time is that the project is less likely to die or be taken over by a company and lead in an unnatural direction. The downside is that it relies on my free time which is split over robotics, cnc, and other things as well as libferris. As some have mentioned, a flatpak or docker image for libferris would be nice. Ironically this makes the whole thing a bit more like plan9 with a filesystem microkernel like subsystem (container) than just running it as a native though rpm or deb, but whatever makes it easier. Years ago I decided to build an indoor robot with multiple kinects for navigation and a robotic arm for manipulation. It was an interesting time working out how to do this and what is needed to get a mobile base to map and navigate a static and dynamic indoor space. Any young players reading this might think that ROS can just magically make this all happen. There are some interesting issues to discover building your own base and some, um, "issues" shall we say that you will need to address that are not in the books or docs. I won't spoil it here for the new players other than to say be prepared to be persistent. There are two active wheels at the front and a single drag wheel at the back about 12 inches behind the front wheels. I wrote the code to control the arm myself as custom ROS nodes. A great trick here is you can inject sinusoidal movement by injecting a shim ROS node to take one target and smoothly move towards it. Now I have a new friend for outdoor activity, the "hound bot". The little furry friend is still sans hair but has gps, imu, rc control override, and a ps4 eye camera mounted for depth perception and mapping. Taking a leaf out of one of the big car makers book and only using cameras for navigation. But for me it is about cost since a good lidar is still much to expensive for the hound. The hound is a sort of monocoque where the copper looking square part at the front is part of a 1/4 inch aircraft grade alloy solid welded chassis that extends the lenght of the robot. The hound can do about 20km/h and is around 20kg in heft. The electronics bay in the middle is protected by a reinforced carbon fibre layup that I did. Mixing material for fun and slight weight loss. One great part about doing this "because I want to" is that I am unbounded. Academic institutions might say that building robust alloy shells is not a worthwhile task and only the abstract algorithms matter. I get to pick and choose what matters based purely on what is interesting, what is hard to do (yay! 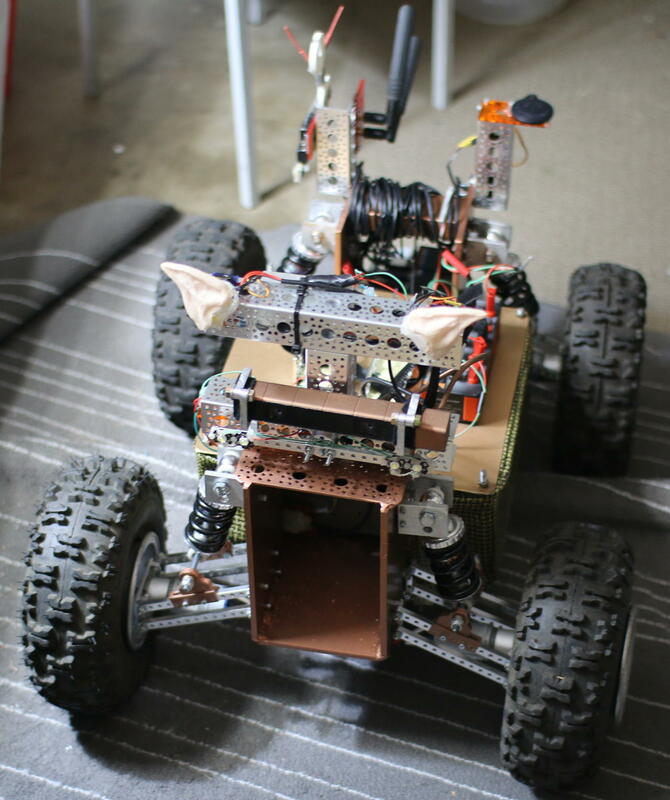 ), and what will help me get the robot to perform a task that I want. The hound will get gripper(s) so it can autonomously "fetch" things for me such as the mail or go find and pick up objects on the lawn.